Top 20 Paleo Vegan Dessert Recipes of 2017 (V, GF): A mouthwatering collection of the best paleo desserts to satisfy your sweet tooth! Vegan, Gluten-Free, Dairy-Free, Paleo. Chocolate. Coconut. Almond Butter. These 3 simple ingredients had THE BEST year on Beaming Baker! Especially when it came to paleo vegan desserts. I started the year with just a few paleo recipes under my baking belt (whatever that looks like), and am ending it with many, many more. Next year, I hope to get way better at paleo baking, but in the meantime, it’ll be loads of fun reminiscing about (i.e. drooling over) the tastiest mostly no-bake paleo recipes of 2017. There’s something for everyone! 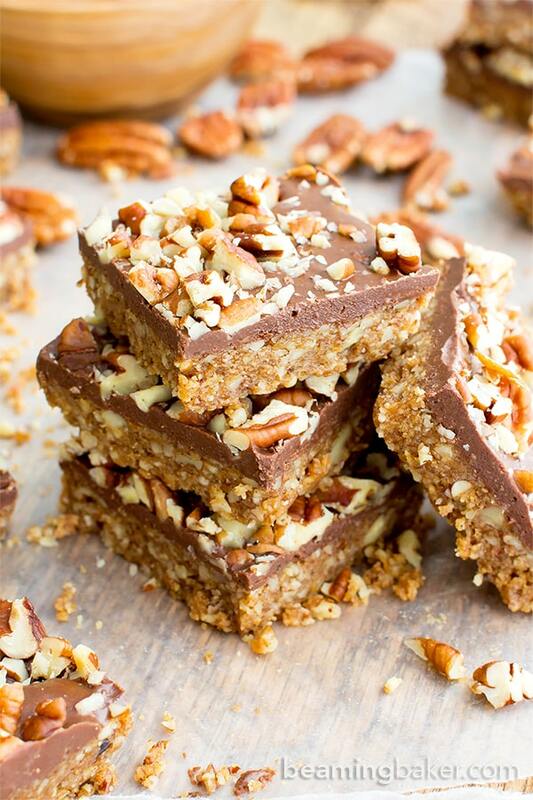 A tasty baked treat, no bake dessert bars (my fave), and even some ice cream for the win! 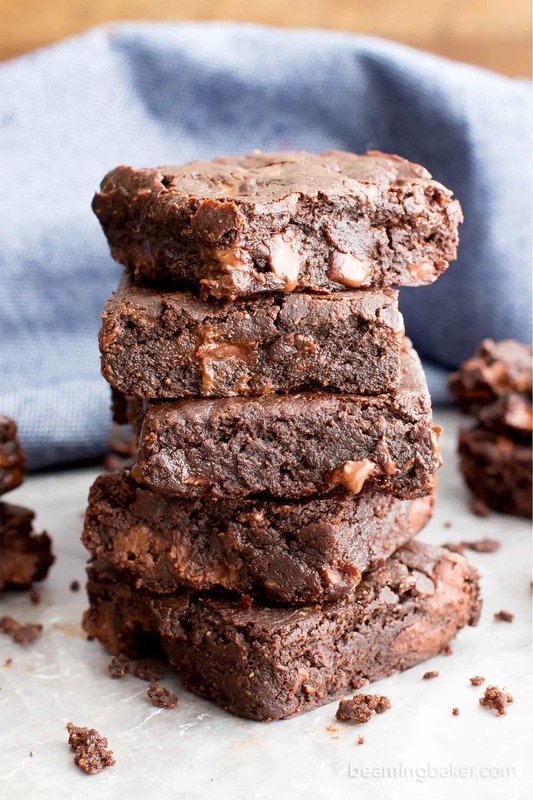 Ultimate Fudgy Paleo Vegan Brownies: SO fudgy and so decadent. A huge reader fave! Anyway, be sure to send me your paleo recipe suggestions/requests for next year. You know I need like 4 months advance notice to work on this shiz! And by shiz, I mean carefully, thoughtfully, and gracefully symphonic recipes that ooze class and taste (but really, taste). In 2018, as always, I’m gonna try my darndest to give you the quality paleo recipes your deserve and expect. Now who’s ready to make some of our newly minted BB paleo classics? Here’s a sneak peek! Number 7 on the list is No Bake Paleo Chocolate Pecan Bars: seriously just 5 ingredients to make this reader fave! 20) Dark Chocolate Nice Cream (V+GF): an easy, 4 ingredient recipe for velvety smooth, rich dark chocolate nice cream made of bananas, cocoa powder and maple syrup. Vegan, Paleo, Gluten Free, Dairy Free. 19) Paleo Apple Pecan Coconut Crisp: a super crisp, nutty topping blanketing warm, apple cinnamon-spiced filling. Vegan, Paleo, Gluten-Free, Dairy-Free. 18) 5 Minute Easy Peppermint Fudge (V, GF): a 3 ingredient recipe for creamy, thick, indulgent chocolatey fudge squares made with healthy ingredients! Takes just 5 minutes to prep, the rest is just freezing time! Paleo, Vegan, Gluten-Free, Dairy-Free. 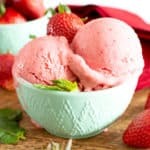 17) 4 Ingredient Homemade Strawberry Sorbet (V+GF): an easy recipe for deliciously creamy and refreshing strawberry sorbet. Vegan, Dairy-Free, Paleo, Gluten-Free. 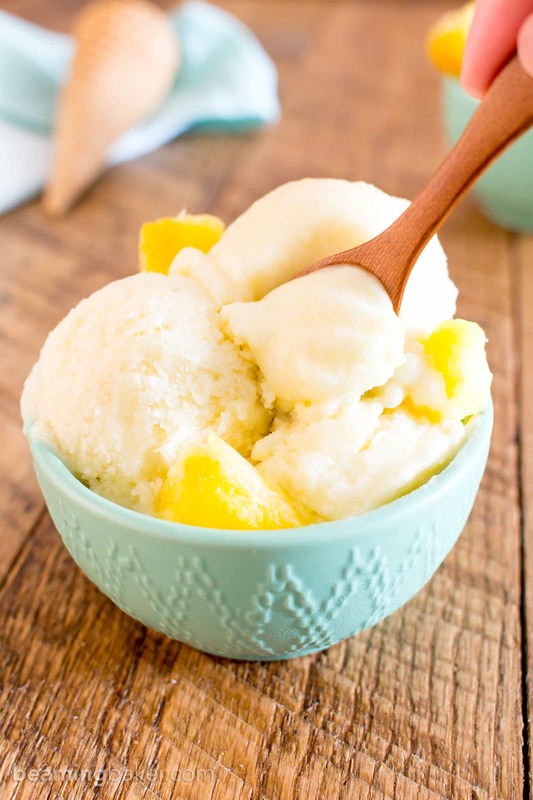 This 2 Ingredient Pineapple Coconut Sorbet (#15 on the list) is so easy to make! Tbh, I totally have to resist just sipping the sorbet mixture before it freezes. Deliciously refreshing. 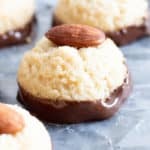 16) Homemade Almond Joy Cups (Paleo, V, GF): a 5-ingredient recipe for rich, nutty Almond Joy cups layered in velvety chocolate. Paleo, Vegan, Gluten-Free, Dairy-Free. Check out the nut-free version here. 15) 2 Ingredient Pineapple Coconut Sorbet (V, DF, Paleo): an easy recipe for deliciously refreshing, healthy pineapple coconut sorbet! Paleo, Dairy-Free, Vegan, Gluten-Free. Photo Above. 14) Skillet-Roasted Maple Cinnamon Pecans (V, GF, Paleo): a 6-ingredient recipe for warm, cozy skillet-roasted pecans glazed with coconut sugar and cinnamon. Paleo, Vegan, Gluten Free, Dairy-Free. Feeling more like using your oven? 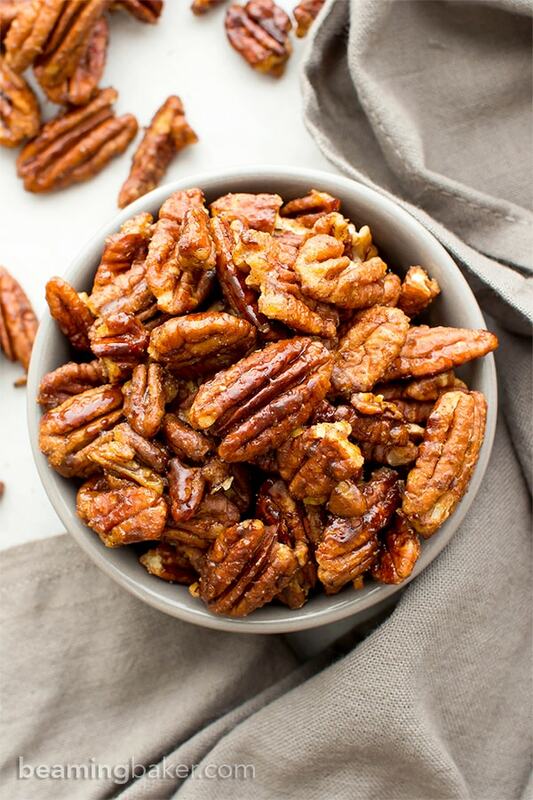 Try my 4 Ingredient Oven-Roasted Paleo Candied Pecans instead! Psst… that one’s oil-free! 😉 Photo Below. 13) Paleo Mocha Frappe (V, GF, DF): a 4 ingredient recipe for deliciously thick, frosty mocha frappes made with simple ingredients. Paleo, Vegan, Gluten Free, Dairy-Free. 12) 3 Ingredient Mango Coconut Vegan Ice Cream (V, DF, Paleo): an easy, no-churn recipe for deliciously creamy mango ice cream bursting with coconut flavor! Dairy-Free, Paleo, Vegan, Gluten-Free. Shoutout to #14 on the list of paleo vegan desserts: Skillet-Roasted Maple Cinnamon Pecans. You feel cozy just looking at this, right? 😉 All you need is a few minutes to whip up these candied pecans. Delish! 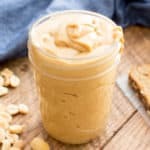 11) Vegan Pumpkin Pie Smoothie (V, GF, DF): a 6 ingredient recipe for creamy, thick pumpkin pie smoothies bursting with fall flavor. Vegan, Paleo, Gluten Free, Dairy Free. 10) Paleo Vegan Chocolate Coconut Truffles (V, Paleo, GF, DF): an easy, 4-ingredient recipe for deliciously textured coconut truffles dipped in chocolate. Paleo, Vegan, Gluten Free, Dairy-Free. 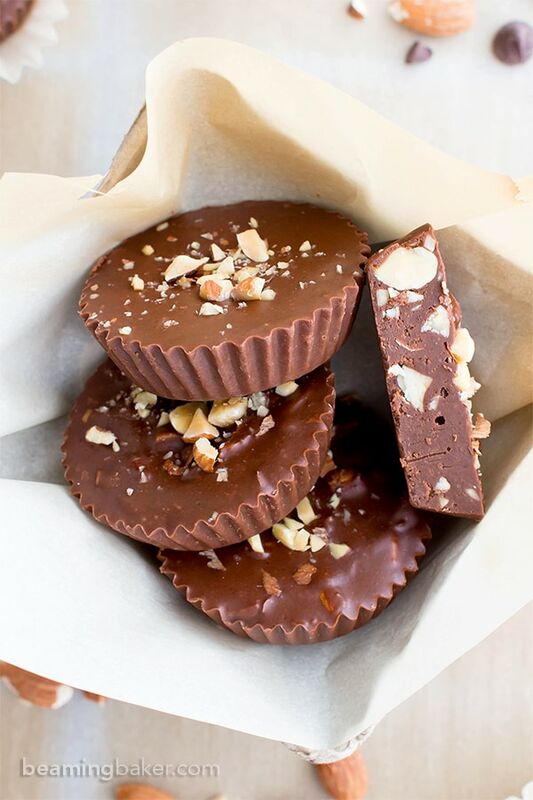 9) Paleo Almond Butter Cups (V, GF, DF): a 5 ingredient recipe for rich chocolate cups stuffed with smooth almond butter. Paleo, Vegan, Gluten Free, Dairy Free. 8) Paleo Chocolate Almond Butter Fudge Cups (V, GF, DF, Paleo): a 3-ingredient recipe for decadently rich almond butter fudge cups packed with almond crunch. Paleo, Vegan, Gluten Free, Dairy-Free. Photo Below. Coming in at #8, a most tasty paleo treat! Paleo Chocolate Almond Butter Fudge Cups: you’re just 3 ingredients away from chocolate fudge BLISS. So tasty and so pretty! 7) No Bake Paleo Chocolate Pecan Bars (V, GF, Paleo): a 5-ingredient, no bake recipe for deliciously textured pecan bars topped with a thick layer of chocolate and nuts. Paleo, Vegan, Gluten Free, Dairy-Free. 6) 4 Ingredient Paleo Chocolate Coconut Cups (V, GF, Paleo): a 4-ingredient recipe for delicious coconut-filled homemade Mounds cups. Vegan, Gluten-Free, Dairy-Free, Paleo. Find the Almond Joy version here. 5) Paleo Vegan Almond Joy Ice Cream (V, GF): a 7 ingredient recipe for deliciously creamy, no churn ice cream bursting with coconut, chocolate and almonds. Vegan, Paleo, Dairy-Free, Gluten-Free. 4) Coconut Chocolate Chip Vegan Ice Cream (Paleo, V, GF): an easy, 6 ingredient recipe for creamy chocolate chip ice cream bursting with coconut flavor. Vegan, Paleo, Gluten-Free, Dairy-Free. Video Above. 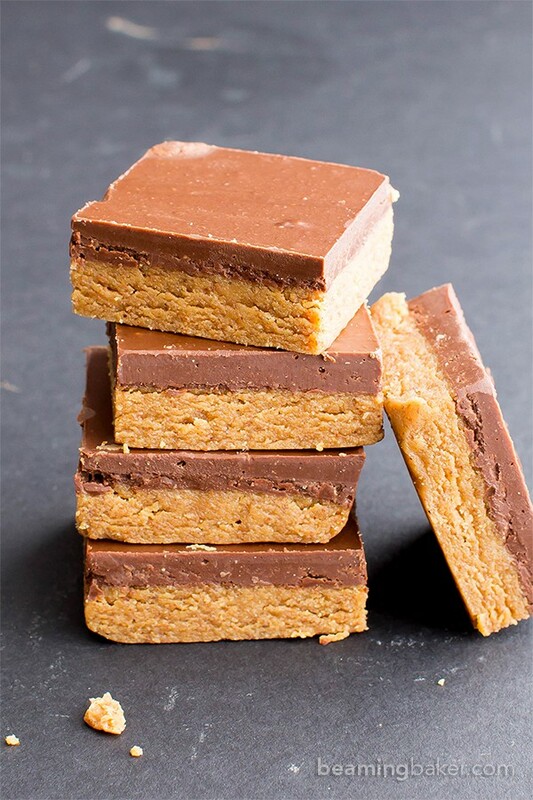 3) No Bake Paleo Chocolate Almond Butter Bars (V, GF, Paleo): a 4-ingredient no bake recipe for thick, decadent almond butter bars topped with chocolate. Vegan, Paleo, Gluten Free, Dairy-Free, Protein-Rich. Seriously thick, decadent bars made with just 4 ingredient! Try my No Bake Paleo Chocolate Almond Butter Bars: a paleo twist on your childhood favorite peanut butter bars! 2) Paleo Almond Joy: a 5-ingredient recipe for deliciously satisfying homemade Almond Joy candy bars bursting with coconut and chocolate. Paleo, Vegan, Gluten Free, Dairy Free. Ultimate Fudgy Paleo Vegan Brownies (V, GF, DF): an easy, one bowl recipe for seriously fudgy, super moist paleo brownies bursting with rich chocolate flavor. Vegan, Gluten Free, Paleo, Dairy-Free. 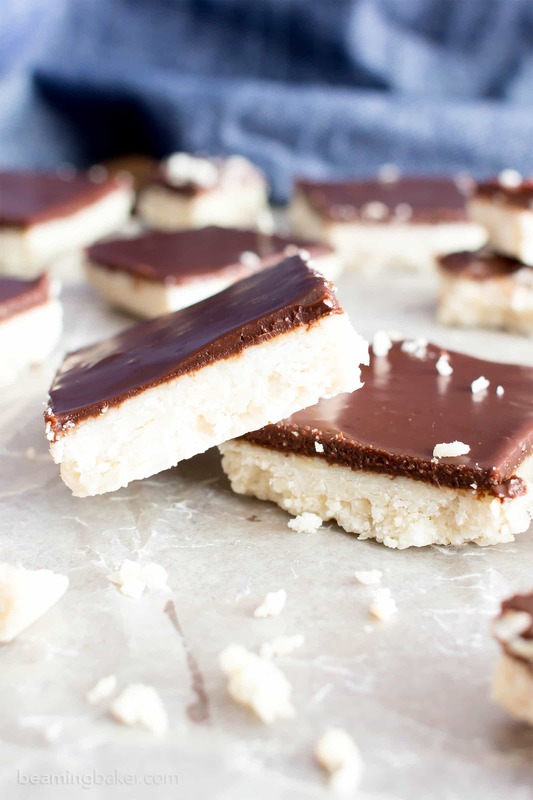 My mom’s favorite: No Bake Chocolate Coconut Bars! Are any of your favorites on this list? What paleo dessert recipes do you hope to see in 2018? Last call for requests!! J/K. There can be more calls in 2018, but remember what I said about 4-months notice… 😉 Wishing you an incredibly happy, warm and love-filled holiday season! Wow! 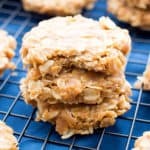 You make paleo baking look good – REALLY good! I want to make those no-bake chocolate pecan bars immediately – and the rest of these pretty much right after that! 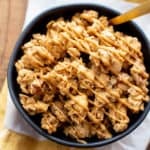 Alllllll of these sound amazing but the ones that are really calling to me are those skillet-roasted maple cinnamon pecans! Girl, you know it’s time to bust out the cinnamon! 😉 Enjoy! You have a great roundup in here! Some great desserts to choose from that is for sure! This is a fabulous array of sweets for the holiday. I don’t actually follow a paleo plan, but this could push me over the edge! This is definitely a tasty and easy way to start! 🙂 Enjoy! Aw, thank you! I take that as a high compliment! Lol. You’ll just love them! 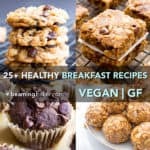 Where can I find the calories for these recipes? I am diabetic so need to know the calories. I love your recipes! 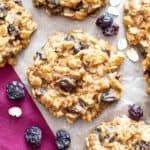 My request would be for vegan paleo healthy cookies that are crispy/crunchy. So many cookies now are soft-baked. Maybe it’s because I grew up with unhealthy store-bought cookies like Chips Ahoy and Oreos, but sometimes I just crave something that’s a little bit toothsome. Although I will say nostalgia is a weird thing. For years after becoming vegetarian (this was before becoming vegan/WFPB, I craved Oreos but wouldn’t buy them because of the lard. Finally, after many years of being Oreo-less, Nabisco tweaked the recipe. No more lard! Happy days! So of course I bought a package and ugh….just seemed like cardboard. No taste. I would hate to think the lard was what made them good—your recipes are lardless of course and delish! 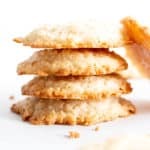 But I sure do remember enjoying dunking them in milk (although then they would soften, so now we are back to soft cookies—maybe I don’t know what I want?). My big request to you: don’t change! I know change can be good, but I enjoy your recipes, stories, writing, and photography way too much to want any big changes for 2018. Thank you so much for your comment, Ellen. 🙂 They always brighten my day–and provide such great insight! Nostalgia is definitely a weird thing! I just had this long conversation with my sister about all of these childhood faves. She said she recently had some of them and they were nothing like she remembered (Twinkies, various ice cream bars, etc.) Probably all of our tastebuds developed and changed over the years to want/truly enjoy different flavors. As for the crispy cookies: consider it done (in like four-five months, of course haha)! 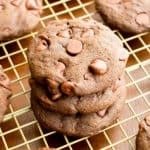 I’m currently testing a crispy, chewy and dense cookie that I think you’ll love. It’s a bit more on the indulgent side, but it’s good to have a super satisfying cheat treat once in awhile! On change: thank you. That means a lot to me. I’ll keep being the same ol’ me, with a few improvements, and I’ll work my best to never disappoint you. Here’s to an awesome 2018! So happy you enjoyed it! Can’t wait to see what you try first! Almond butter chocolate bars were a huge hit in my family. Thank you for the great easy recipe.